Flip Out Mama: Land O' Frost Wrap Kit: A Yummy Review! It has been SO hot around here lately! We have been looking for yummy things to eat that don't require heating up the oven... After awhile, it gets hard to think of something different for the Summer months! 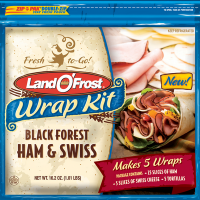 That's why I was so excited when we got the chance to try a couple of Land O' Frost NEW Wrap Kits! These kits are great: you get meat, cheese, and tortillas all in one package.. It's everything you need to make 5 super delicious wraps! I love anything convenient, so this was right up my alley! We received both the Black Forest Ham and Swiss, and the Oven Roasted Turkey and Pepper Jack. They were so yummy! We had these last week on a really hot evening. We had some tomato and lettuce left over from when we had burgers, so we put that on ours as well! Everybody was really impressed with these Wrap Kits, especially the fact that the meat is already portioned out so you have enough for five wraps! Even the boys ate these, and c'mon, you know that means they were good! One of my favorite parts is that one wrap fills you up pretty good, and is only around 200-230 calories! LOVE that! If you have never visited Land O' Frost's website, you really should! They have so many different great products, including lunch meat (of course), sub sandwich kits,and much much more! Click here to visit and see what kind of super yummy stuff you can find for your family! I received a sample of the above mentioned product in order to conduct a review. although a sample product was received, all opinions are my own, and no monetary compensation was received. i haven't seen these at our grocery yet! they look yummy and we love subs and wraps here.